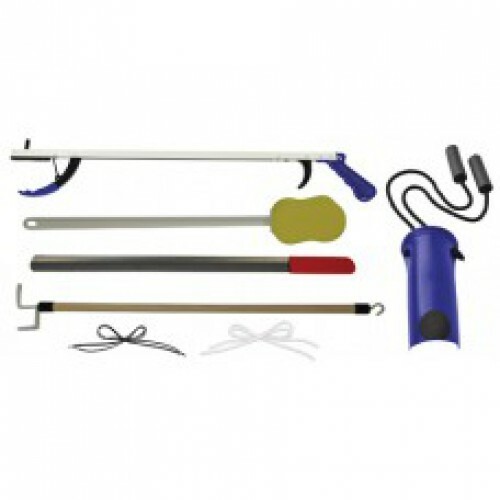 The Stop your Bending Deluxe Hip Kit-7 piece by Blue Jay is ideal for geriatric or disabled persons. 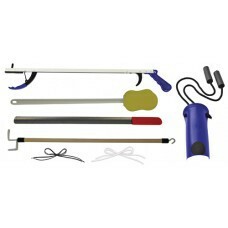 The following pieces are: a 26 inch lightweight reaching aid, a 24 inch Dressing stick and a sock aid with foam handles. Also, the kit provides a Metal Shoehorn, with black and white elastic shoelaces. BOY, WAS I GLAD WHEN MY ITEMS ARRIVED. I FELT SO PLEASED TO BE ABLE TO PUT ON MY SOCKS AND SHOES. I'M OVERALL PLEASED. I DID NOT KNOW THE SHOESTRINGS WERE INCLUDED IN THE PACKAGE. I WAS DELIGHTED TO RECEIVE THEM BECAUSE I AM HAVING TROUBLE FINDING THIS TYPE.... SO THANKS. ALSO, ABOUT THE EXTRA LONG SHOE HORN... IT IS EXTRA LONG AND DURABLE BECAUSE IT BEING MADE OF METAL. NOT SHORT, AND I CANNOT BREAK IT!